So you are planning to get inked? That’s great! But remember, getting a tattoo is not an easy task by any means. If you are dying to have a tattoo on your skin and maintain it for a long time, it is important that you follow a few safety precautions both before as well as after the procedure. Never ever try to tattoo your skin on your own. Rather, find a well-known registered tattoo studio, which has trained and efficient employees. The tattoo artist needs to be a licensed and he/ she must follow the standard regulations for tattooing. The experience of the artist also matters a lot. The studio should abide by necessary hygiene as well as safety standards. The place should be clean and the staff should also maintain proper sanitation. The studio staff must wash their hands before each and every procedure and use a pair of disposable protective latex gloves. Needles, tubes, containers, trays, pigments, etc. used by the tattoo artist should be unpacked right in front of you. If they don’t come in sealed packages, chances of cross-contamination as well as blood-borne ailments go up significantly. The non-disposable equipment used in a tattoo studio must be sterilized in an autoclave (heat sterilization machine) with bleach and a good disinfectant after every single session to avoid infections. Make sure that the ink or dye, which is going to be used on you, is approved for tattooing. This is because most of the inks intended for tattoos are prepared from skin-irritating metals, which can lead to allergic reactions. In case of diluted inks, the water used must be sterile. Check the expiration date of the ink before you get your tattoo. Using expired ink is extremely risky as it can infect your blood severely. The tattoo artist should pour the ink into a single-use container and dispose the excess amount after finishing the procedure. Go through the after-care instructions carefully before getting inked. It would help you understand the risks and precautions beforehand. If possible, be present at the studio while someone else is getting tattooed. It will let you know whether the entire affair is going to be a safe bet for you or not. Do not remove the bandage from your tattoo before 24 hours. It is essential for keeping air-borne bacteria away. Keeping it clean is the first and foremost condition of taking care of a tattoo. Wash it with a gentle liquid antibacterial soap and lukewarm water as soon as you take off the bandage. Stay away from rubbing. Rather, pat it dry with a paper towel softly. Make this an everyday practice. Once you have cleaned the area, apply a good antibiotic ointment containing vitamin A and vitamin D. Generous application of this is required for keeping infections at bay and speeding up the healing process. Taking shower every day is good for keeping the tattoo clean and safe. But, it is advised that you only wet or saturate the design instead of soaking or submerging it in direct streams of water (in case of deep bath or hot tub) for the first couple of weeks. Do not let the tattooed skin get in touch with soap or shampoo during that time. Keep the newly tattooed portion of your skin moisturized and healthy by applying a mild moisturizer at least 3 to 4 times a day. If you wish, you can also use a fragrance and pigment free body lotion, hand lotion, or certain specialty products. However, keep away from Neosporin as it can lead to serious allergies. Try to avoid sun exposure as much as possible for the first few weeks. The dazzling light, excessive heat and UV rays of the sun can damage your skin and fade away the hue of your tattoo as well. It is recommended that you use a sun block of 30 SPF or more while going out in the sun. Swimming should be avoided until your tattoo gets healed completely. Be it pools, lakes, rivers, steam rooms or sauna baths, the water itself can cause minor to major infections, damaging your tattoo badly. Wear loose clothes that do not rub against your tattooed skin. You should choose the fabric carefully, so that you do not perspire a lot. 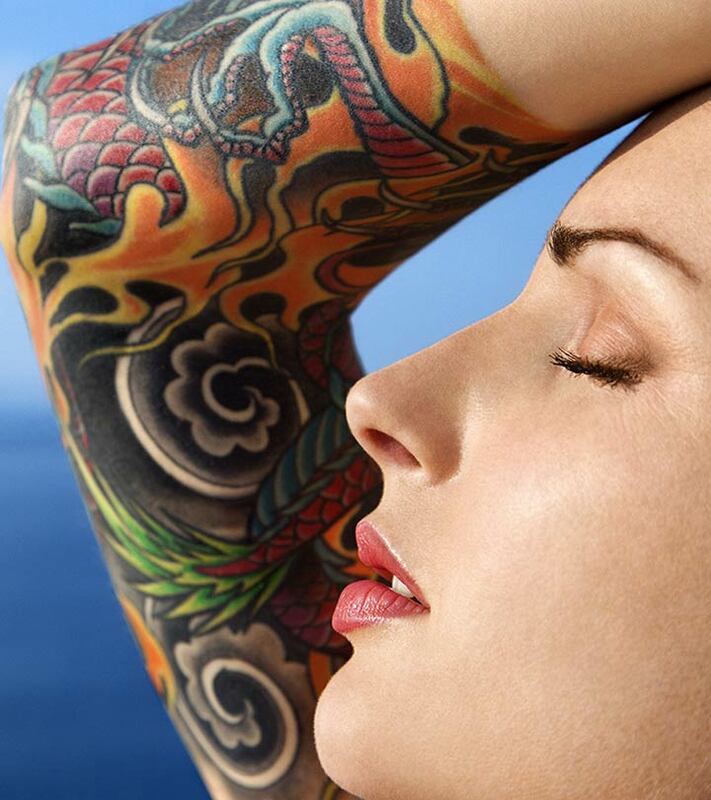 Your tattoo may peel or scab during the period of healing. It can also get extremely itchy as the scabs starts to flake off. However, never ever pick or scratch the scabs. Rather, opt for warm moist compresses. Applying it 3 to 4 times a day (at least for 5 minutes each) will make the scabs softer and help them come off automatically. Just in case if you end up disliking your own tattoo, fret not, as here is how to remove permanent tattoo. It is always advisable to follow these safety precautions before and after getting your favorite tattoo and prevent it from turning into a disaster overnight. Do you have a tattoo? What preventive measures did you take while you went through the process? Let us know by commenting below. Get associated with a tattoo community to aptly shape your tattoo ideas and enlighten you with the precautions to be taken.